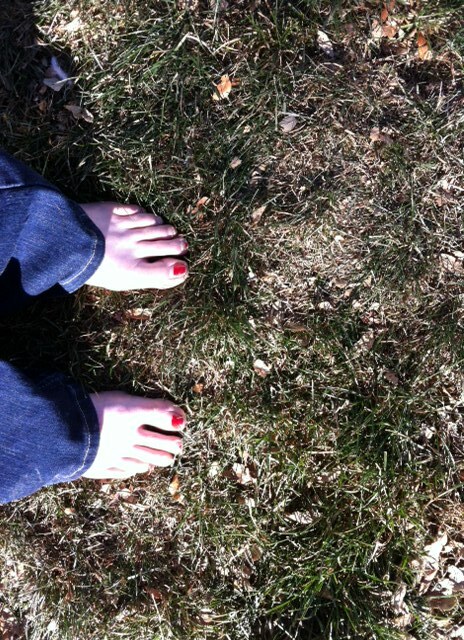 Feet in the Dirt – That's Natural! Have you put your feet in the dirt lately? Did you know that the earth carries a negative charge, and that you may actually feel better if you take five or ten minutes to stand barefoot in the dirt (or even in the grass)? Some people call this “grounding”, and for myself, has been a wonderful way to feel better after staring at a computer screen, or being on a cell phone, all day. Most objects on the ground carry a positive charge, and so by actually physically connecting with the earth, you can “stay balanced” electrically (we are energy). The earth, and us as human beings, have an amazing connection. Just like we depend upon the earth (and universe) for energy to power up our computer and phones, we also rely on the earth to feed ourselves, and to of course, to have a clean water supply. There are many people in our country, who do not have the time to go and take their shoes off to stand in the dirt – there are arguably people who have never touched the earth’s surface with their bare feet – and it is my hypothesis that this creates people who are out of touch with the planet – literally and figuratively. Until to put your feet in the dirt, or take your shoes off and put your feet in a stream or creek – you may not realize just how powerful the phenomena is. It is my goal to get as many people as possible taking their shoes off and taking 10 minutes to stand in the dirt. If you can actually get out on a trail, out of the city, that is even better. If you can put your hands in the dirt too, and plant something or grow something to eat – that is the next step to connecting to your power source – agriculture. But just a little bit helps – I bet you will see positive health benefits. You know this is music to my ears ! ! !